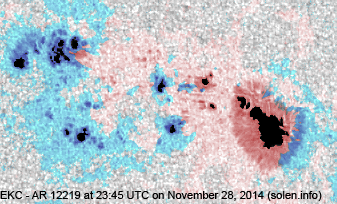 Last major update issued on November 29, 2014 at 05:30 UTC. 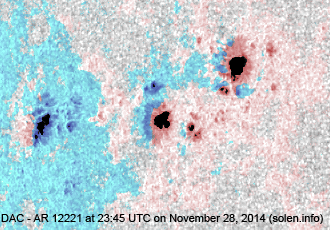 The geomagnetic field was quiet on November 28. 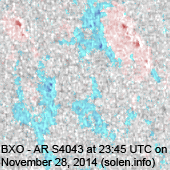 Solar wind speed at SOHO ranged between 341 and 413 km/s, weakly under the influence of a stream from CH644 after 07h UTC. 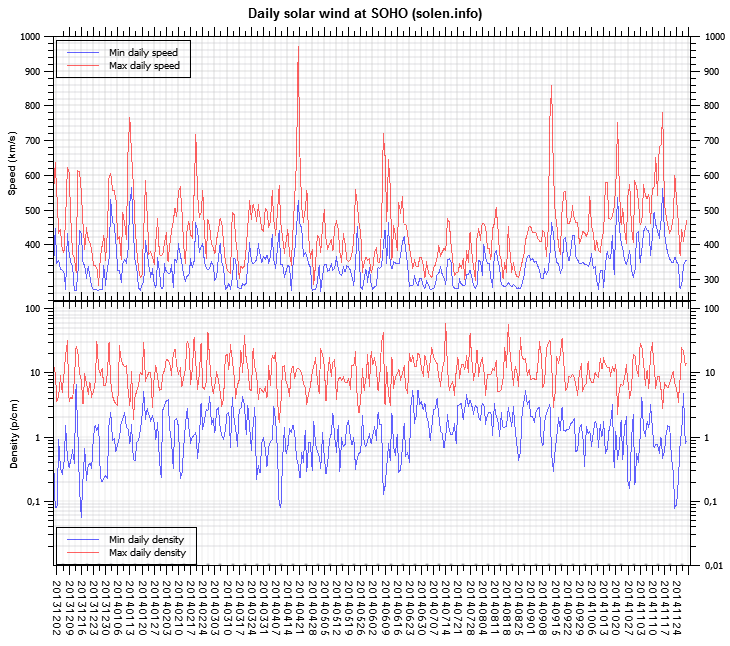 The interplanetary magnetic field was predominantly northwards all day resulting in no significant geomagnetic disturbance. 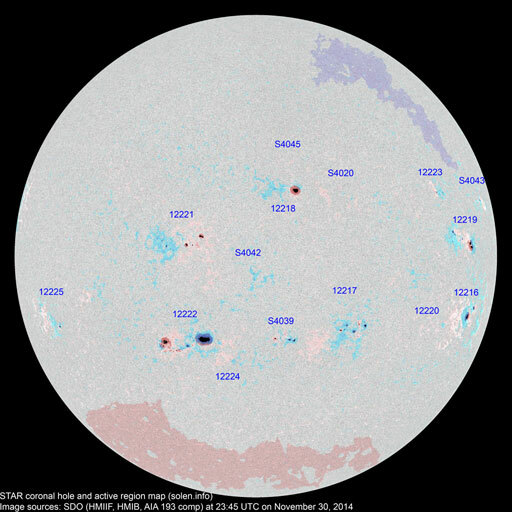 The IMF saw some southwards excursion early on November 29. 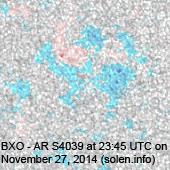 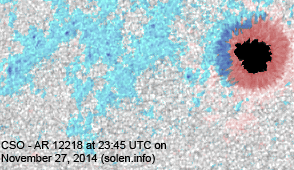 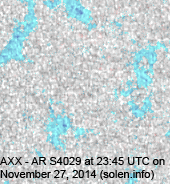 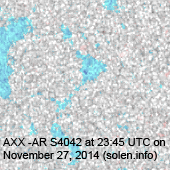 Solar flux at 18h UTC on 2.8 GHz was 181.4 (increasing 61.5 over the last solar rotation). 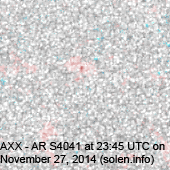 The 90 day 10.7 flux at 1 AU was 150.1 - the highest since May 5, 2014). 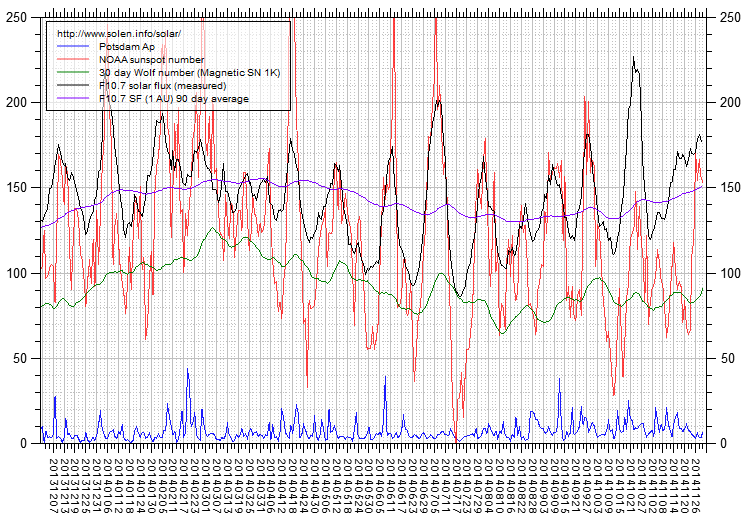 The Potsdam WDC planetary A index was 3 (STAR Ap - based on the mean of three hour interval ap indices: 3.3). 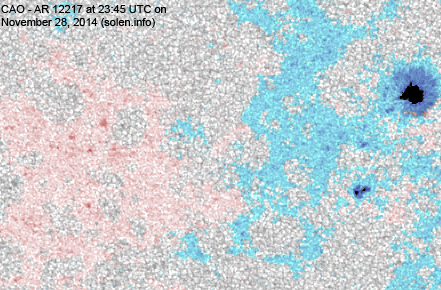 Three hour interval K indices: 00002211 (planetary), 10002321 (Boulder). 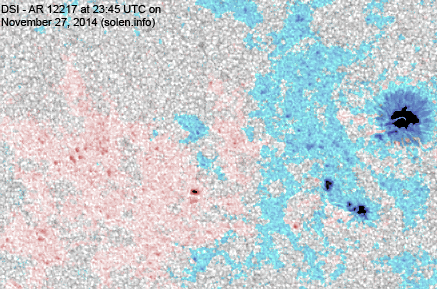 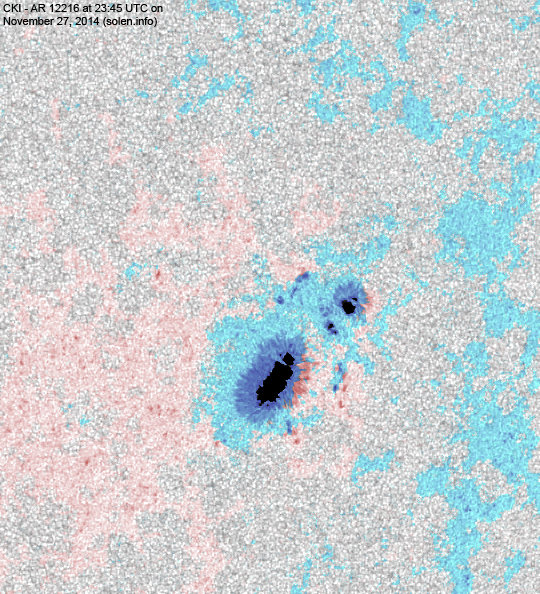 At the time of counting spots (see image time), spots were observed in 11 active regions using 2K resolution (SN: 304) and 11 active regions using 1K resolution (SN: 215) SDO images on the visible solar disk. 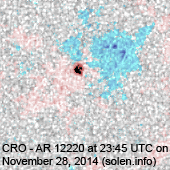 Region 12216 [S13W38] was mostly quiet and stable. 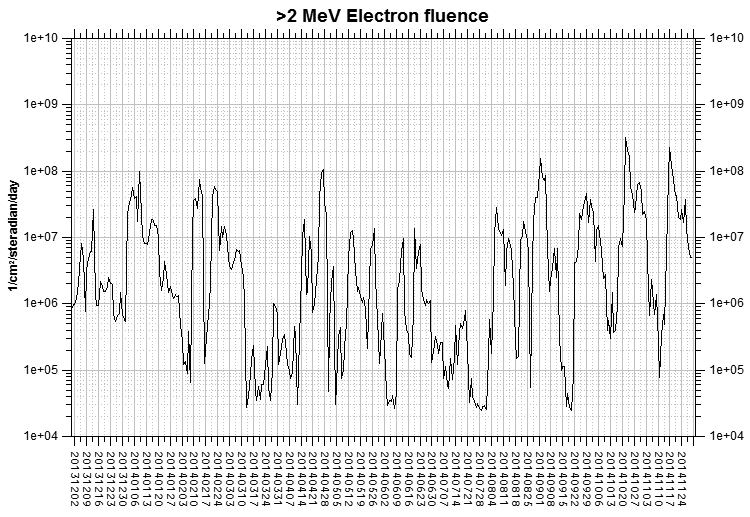 Region 12217 [S18E02] decayed slowly and quietly. 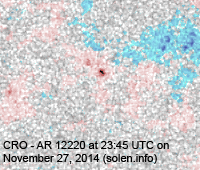 Region 12218 [N16E17] was quiet and stable. 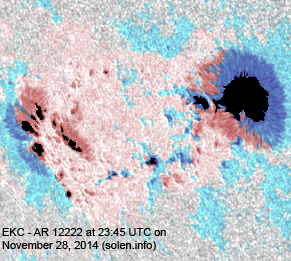 Region 12219 [N03W34] extended longitudinally and still has M class flare potential. 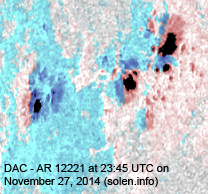 Region 12220 [S16W26] developed slowly and quietly. 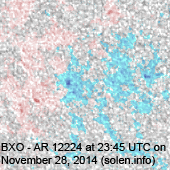 Region 12221 [N04E44] was quiet and appears to be slowly decaying. 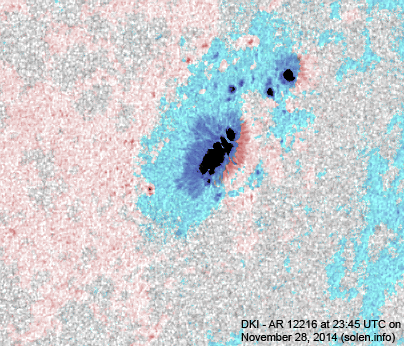 Region 12222 [S19E43] developed slowly and could produce an M class flare. 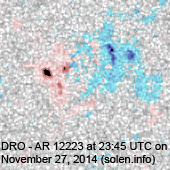 Region 12223 [N17W25] decayed slowly and quietly. 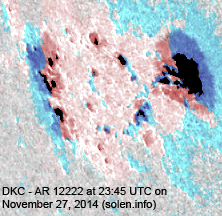 New region 12224 [S24E33] emerged on November 26 and decayed on November 28 when it was numbered by SWPC. 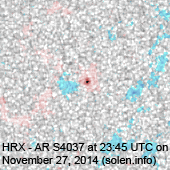 S4020 [N15E05] reemerged with penumbra spots. 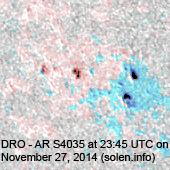 New region S4043 [N13W45] emerged with penumbra spots. 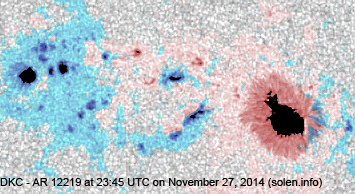 November 25-27: No obviously Earth directed CMEs were observed in LASCO imagery. 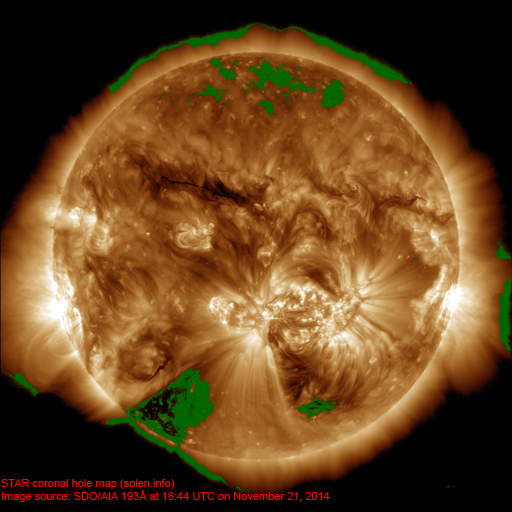 A recurrent northern hemisphere coronal hole (CH644) was in an Earth facing position on November 25-26. 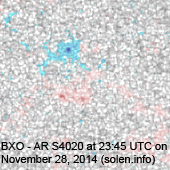 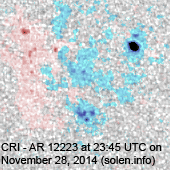 The development of AR 12219 reduced the southernmost extension of this CH. 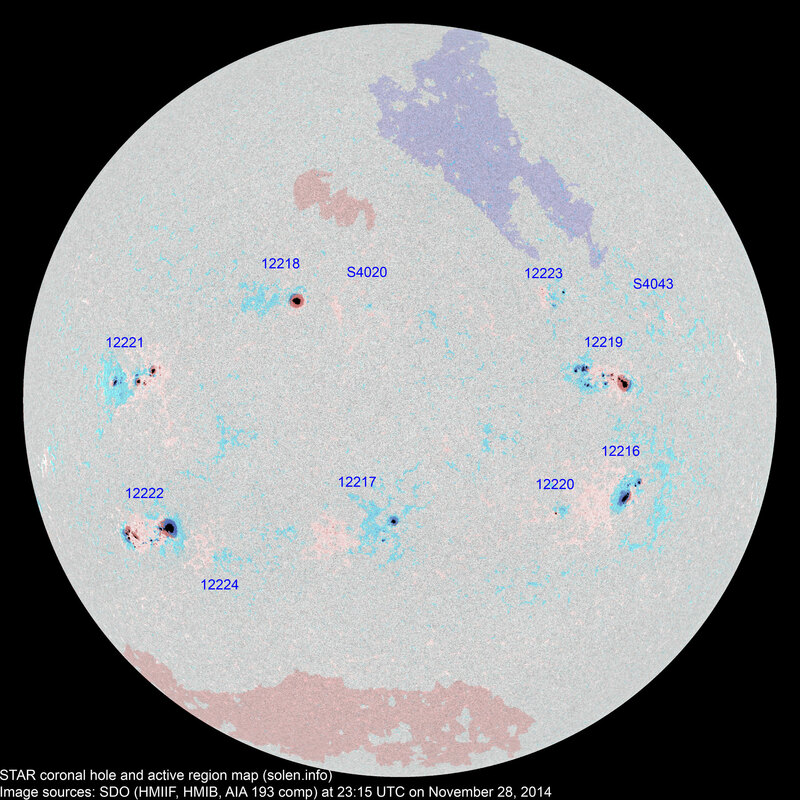 The geomagnetic field is expected to be mostly quiet on November 29 - December 1 with a chance of unsettled intervals on November 29 due to weak effects from CH644.